White Bryony (Bryonia alba) also know as devil’s turnip or western kudzu, is a fast-growing perennial climbing vine native to Europe and Northern Iran. 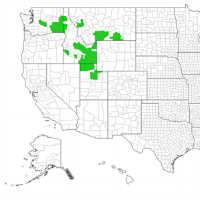 The invasive plant was reported as early as 1953 in Montana (Rice 2017), and subsequently reported in four other western states in the United States (Figure 1). The vine can grow as much as six inches per day to a length of 150 feet, swiftly covering trees, shrubs or structures with dense mats of foliage (Figure 2). It is classified as a noxious weed in Idaho, Oregon and Washington. Figure 1. Distribution of White bryony in the Western United States (EDDmapS 2017). Figure 2. White bryony swiftly covers trees, shrubs or structures with dense mats of foliage. (Courtesy of Danielle Gunn, Idaho Coop. Ext. Service). White bryony initiates growth in spring from a large underground tuber that can be up to 18 inches in length (Figure 3). 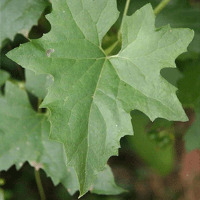 Leaves are five-lobed, palmately compound, rough to the touch, and up to five inches long (Figure 4). Stems have long, unbranched tendrils that are associated with leaves. Flowers clusters form in the leaf axis and are yellowish white, producing green berries that turn dark purple in late summer (Figure 5 and 6). Three to six seed are borne in each berry and are readily spread by birds. White bryony is a member of the Cucurbitaceae (cucumber) family. Figure 3. White bryony initiates growth in spring from a large, fleshy underground tuber. (Courtesy of Danielle Gunn, Idaho Coop. Ext. Service). White bryony is usually found in windbreaks, riparian areas, fence rows, gardens, and wildlife plantings. Desirable trees and shrubs can be killed when bryony stems block sunlight, reducing wildlife habitat and modifying plant community structure. Snow accumulation on vines can also lead to branch breakage on desirable plants, reducing tree vigor and allowing for invasion by diseases and insects. Figure 4. White bryony leaves are five-lobed, palmately compound, rough to the touch, and up to five inches long (Robert VidÉki, Doronicum Kft., Bugwood.org). All parts of white bryony contain bryonin, a toxic substance that may cause illness or death. Although considered a medicinal plant at appropriate doses, the herb and products prepared with it may result in kidney damage, vomiting, seizures and spontaneous abortion. White bryony sap can also cause skin irritation and dermatitis. Livestock may be poisoned by consuming the fruit and leaves, although birds readily eat fruit without any observed detrimental effects. Figure 5. Flowers are yellowish white are borne in clusters. (Robert VidÉki, Doronicum Kft., Bugwood.org). Figure 6. Berries mature to a dark purple in late summer and early fall. (Jan Samanek, Phytosanitary Administration, Bugwood.org). The most effective treatment is to cut the tuber three to four inches below the crown of the plant and apply glyphosate (Accord® XRT II) immediately to the cut root surface. Fall is the optimum time to cut roots and apply glyphosate. Foliar application of herbicides to white bryony is difficult since treatments can damage non-target desirable vegetation. Remove the vine from the host plant prior to herbicide application to avoid non-target injury. Several herbicide applications may be necessary to achieve complete control. White bryony is difficult to control by hand pulling, cutting or disking alone. Protective gear (e.g., gloves and long sleeves) should be worn when removing the vines since bryony is a skin irritant. It is very difficult to completely remove the large underground tuber from soil. Control by digging is most effective if the root is severed at least 3 to 4 inches below the crown; the closer to the surface that the cut is made, the more likely the plant will resprout. Cutting must be continued until growth from the tuber ceases to occur. Control with cutting is much more effective if combined with a herbicide treatment as described above. Gunn D, D Morishita and W Bohl. 2014. White Bryony. University of Idaho Extension. CIS 1203. Online at http://extension.uidaho.edu/clearwater/files/2014/10/White-Bryony.pdf. EDDMapS. 2017. Early Detection & Distribution Mapping System. The University of Georgia - Center for Invasive Species and Ecosystem Health. Available online at http://www.eddmaps.org/. Accessed January 25, 2017. Oregon Department of Agriculture. 2008. Weed Risk Assessment for White Bryonia, Bryonia alba L. Available online at https://www.oregon.gov/ODA/shared/Documents/Publications/Weeds/PlantPestRiskAssessmentWhiteBryonia.pdf. Rice PM. INVADERS Database System. Division of Biological Sciences, University of Montana, Missoula, MT 59812-4824. Available online at http://invader.dbs.umt.edu. Accessed January 25, 2017. Stannard M. Revised by T Heekin. June 2002. White Bryony: “The Pacific Northwest Kudzu.” U.S. Department of Agriculture, Natural Resources Conservation Service, Pullman, WA and Moscow, ID. 4. ®™Trademark of Dow AgroSciences, DuPont or Pioneer and their affiliated companies or respective owners. Consult the label before purchase or use for full details. Always read and follow label directions. Active ingredients for products mentioned in this article. Product (active ingredient): Accord XRT II (glyphosate).